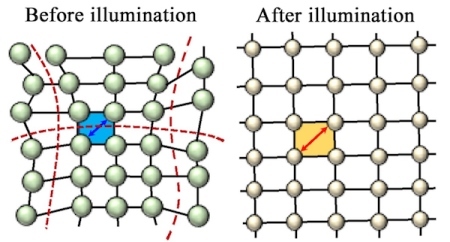 “Hybrid perovskite crystal structures have a general formula of AMX3, where A is a cation, M is a divalent metal and X is a halide,” Mohite said. “It’s a polar semiconductor with a direct band gap similar to that of gallium arsenide. This work was supported by the Department of Energy’s Office of Energy Efficiency and Renewable Energy and its Basic Energy Sciences office.